Amidst the hustle and bustle of your blissful wedding day, certain details and memories get overlooked on the big day. You will always remember the first dance, the look of joy on the faces of your guests and the way you felt in that gorgeous gown, but there are so many more small details that are overlooked and forgotten once the special day is over. The main fashion focus is on the wedding gown, and many of the other small accessories and details go unnoticed. Here are some perfect wedding-day accessories that you and your guests, family and friends will remember as much as the gown itself. Many modern brides are forgoing a traditional veil in lieu of a glittery headband, pearl-adorned tiara or other alternative headpiece. 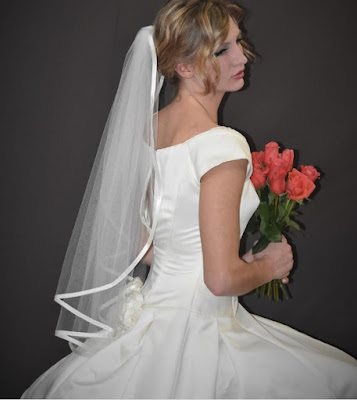 However, there are many brides that still love the classic and timeless look of a wedding veil. Whether you are creating a custom-made veil or tweaking a headpiece that has been passed down for generations, veils are the epitome of a blushing bride. Many custom-made wedding veil styles are available online. One example of a company with custom-made veils is: https://weddingveil.com/pages/about-us. Keep it simple and classic on your wedding day for timeless photos and jewelry you can wear for all of time. Classic pearl drops and diamond stud earrings complement your look beautifully without stealing the spotlight and taking away from your gorgeous new wedding band and engagement ring set. An often understated accessory on your wedding day are the shoes you choose. Most brides end up ditching their shoes once they hit the dance floor. However, if you opt for comfort and a fun pop of color over a stiletto heel, you will turn heads and have a more memorable wedding day. Low-top sneakers are unexpected as are brightly-hued kitten heel pumps under a wedding gown. Your wedding-day accessories are just as important as the gown itself. Whether you are borrowing accessories, wearing a treasured family heirloom or buying brand new jewelry and shoes for the big day, your wedding-day accessories should excite you as much as your gown.